This isn’t a review, but the unedited version of an article based upon interviews with the band. It’s some ten thousand miles from Brooklyn to Blackheath, NSW, and six of the same mathematical breed from County Fermanagh to Okinawa, though neither the crows nor the various flight paths are likely to pass over Budapest on these journeys. One of those Irish musicians, and far more than a significant half in terms of his later career, was the guitarist (and later Irish bouzouki maestro) Dónal Lunny who’d learnt the music industry’s ropes as a member of the folk-pop Emmet Spiceland. As Dónal recalls, “Ever since Andy introduced me to Bulgarian music I had a desire to play it. I was already interested in different time signatures from listening to Dave Brubeck and other jazz players.” Though whether Brubeck would ever have considered combining the 9/8 rhythm of an Irish slip jig with the 9/16 of a Bulgarian daichovo horo, as Irvine and Lunny have found and enjoyed themselves doing is open to question. On said Balkan travels, in Ljubljana Andy also bumped into a young musician from the Netherlands, Rens van der Zalm. The Dutch fiddler and guitarist Rens had become immersed in “the music of Leadbelly, Big Bill Broonzy, Pete Seeger and the New Lost City Ramblers and more..” in his teens and started to play this music in coffee houses with older mentors, though “his violin teacher was not very amused”. Rens and Andy would meet up again during the 1970s when Planxty (formed with Dónal, uilleann piper Liam O’Flynn and Christy Moore) toured Europe. By which time the fascination Andy and Dónal shared for those Balkan rhythms had become a substantial element in the band’s repertoire. Fast forward a few years to the early 1980s. Planxty’s career had stuttered after its genesis with Christy reinvigorating his solo career and Dónal embarking on the full-pelt sleighride also known as The Bothy Band. In the midst of this period Andy and Paul Brady formed a powerful duo, recording one of Ireland’s essential albums in the process. However, by 1979 the original members of Planxty were back together again (with the addition of Matt Molloy on flute) and the reincarnation’s first album included perhaps the best-known result of Andy’s and Dónal’s Balkan interests, the 9/16 Bulgarian dance tune ‘Smeceno Horo’. By then Andy had also released his debut solo album, Rainy Sundays Windy Dreams and, after Planxty’s seemingly final demise (reformed for a short time this decade, but never likely to play again), he embarked upon his most ambitious project so far. This was the band Mosaic which resulted from further Balkan ventures and involved singer Márta Sebestyén from the Hungarian band Muzsikás who also played gardón , Hans Theesink (nowadays regarded as one of the world’s finest blues guitarists), singer/bassist Lissa (from Denmark) and, initially, Scotland’s Dougie MacLean. However, Dougie decided that the project wasn’t for him so, after an abortive attempt to involve Dolores Keane and John Faulkner, Dónal Lunny arrived on the scene, bringing with him the young uilleann piper Declan Masterson. The newly-fledged band embarked on a tour whose English segment resulted in fabulous reviews, but, in Andy’s words, ‘we were a very happy band but we had the sense to leave it at just the one summer! Still, I don’t think I’ll ever forget Márta playing the gárdon, a Translvanian percussion instrument that looks like a stone age cello, on sets of Irish reels!’. 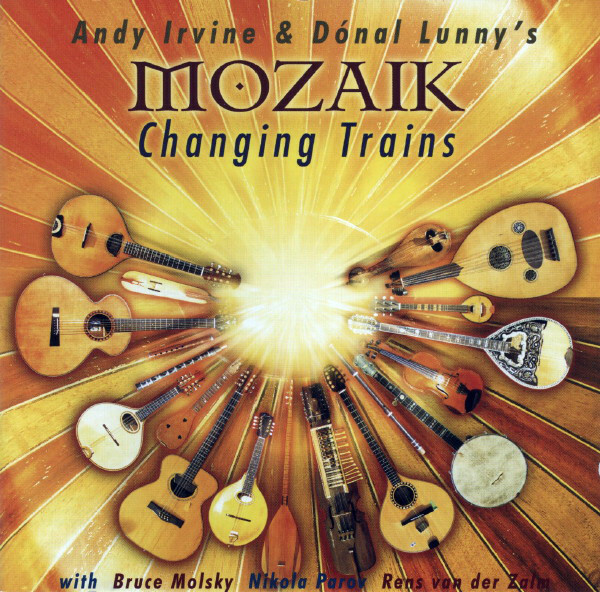 While Andy’s solo career progressed during the latter half of the 1980s, a key musical moment occurred in 1992 with the release of the East Wind album, a collaboration with uilleann piper Davy Spillane. Produced by Bill Whelan, and featuring a feast of cross-cultural musicanship, this was undoubtedly the first (and probably the last) attempt to meld Bulgarian, Macedonian and Irish music together. Its cast included Nikola Parov, a multi-instrumentalist from Sofia (proficient on gadulka, kaval, gaida and bouzouki) whom Andy had previously met at a festival in Hungary. The album was critically acclaimed, but poorly bought. Subsequently, Andy, Nikola and Rens (who had played on Andy’s second solo LP Rude Awakening) toured Europe together as the East Wind trio. During his solo career in the 1990s Andy often toured the US and it was during one of these trips that he met Bruce Molsky, a Bronx-born fiddler with an insatiable appetite for Appalachian music. Little immediately accrued, but while touring Australia in the dwindling years of the last millennium, an idea suddenly struck Andy. “I do a lot of driving in Australia – I own a Land Cruiser out there. Driving really makes me use my brain and it suddenly came into my head that it would be great to do a tour of Australia with a band and that led to the question ‘What kind of a band?’. That thought led in turn on to Irish, Old Timey and Balkan music and then the people more or less picked themselves. The emails began to flow. As Bruce puts it “Andy contacted me with a very simple email in 2001, and asked pretty much ‘Hey, want to come to Australia and make a band?’ Well it was a bit more descriptive than that; the whole idea sounded mysterious and pretty exotic.“ Dónal, Rens and Nikola were equally receptive and the newly-formed band, henceforth known as Mozaik, first convened in Australia in March 2002. After just several days of rehearsal it embarked on a short tour whose results can be heard in the form of the album Live at the Powerhouse which, as all the bands’ members would probably agree, only partly encapsulates the unique instrumental configuration which trod the boards on those nights. Subsequently, there was another Australian tour, one of the US and a couple of visits to the UK, but it was 2005 before this band of musical itinerants actually spent time in the recording studio. The result was the album Changing Trains, whose title relates only partly to two of its tracks, which was released only in Australia that year. Subsequently remixed, it’s now more generally available, though it’s an absolute mystery why a band of such calibre has to self-finance its own album. The album’s ten tracks incorporate all the disparate elements that Mozaik’s members bring to the melting pot. There’s Andy’s self-composed songs (including ‘O’Donoghue’s’, his wonderful paean to the glories of Dublin’s most famed session pub in all its 1960s pomp and prime). Then there’s Bruce’s ‘Reuben’s Transatlantic Express’, reinvigorated by Nikola’s input of Rumanian rhythms. Add to that the eclectic ‘Pig Farm Suite’, first played at an Italian venue which was once a piggery, and the exceedingly rare sounding of a lead vocal from Dónal Lunny on the Donegal song ‘Siún ní Dhuibír’. The last time the Lunny larynx was heard on record was on ‘Bean Phaidín’ on the Planxty album The Well Below the Valley. Additionally, there’s ‘Sail Away Ladies’, first recorded by ‘Uncle Bunt’ Stephens in the 1920s and a wonderfully resonant version of the song ‘Reynardine’. And neither should we be. This article by Geoff Wallis originally appeared in the Jan/Feb 2008 edition of fRoots magazine.